I was having coffee in a shop in Fells Point recently when an older guy next to me struck up a conversation about something he saw on my laptop. The conversation bounced across a few topics, then landed on the riots and protests over police shootings and the alleged widespread use of excessive force. He told me his name was Lou. Lou was quick to point out in “his day” if a police officer asked you a question, you answered it with respect. Why? “Because if you want respect you have to give it”, he said. He quickly added, “Nobody wants to take responsibility for their own actions. 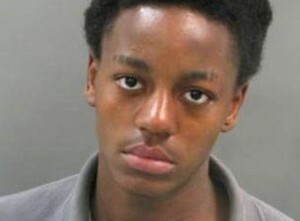 The youth insome neighborhoods feel they have a right to shoplift, steal, get high and do whatever the hell they want, and if any authority challenges them, they get pissed off”. He leaned in closer to me and brought up the recent fatal shooting of Antonio Martin, 18, in Missouri near the Ferguson incident. 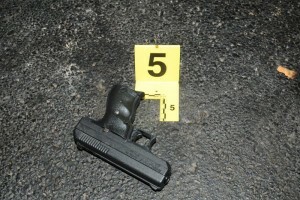 This gun was recovered at the Antonio Martin shooting scene. His comments brought back memories of what I heard growing up. I learned at an early age what it meant to take responsibility for my actions. Personal responsibility must be part of the bedrock of any community, any society, that wants to survive and thrive. If we get to the tipping point where the majority of people in a community no longer value the importance of personal responsibility with a clear sense of right and wrong, then we will have a deterioration of our shared values. After a pause and a sip of coffee he said something truly incredible. “You know what I’d like to see? I’d like to see people wearing blue shirts that say COPS’ LIVES MATTER. Me too, Lou, me too. The majority of cops are good people who love their work & feel honored to protect & serve. The majority of blacks are not criminals & don’t deserve to be harassed. However, sometimes being in the wrong place at the wrong time, sometimes means that the police are going to want to talk to you/him/her/whomever. Sometimes someone innocent is killed, most often not by law enforcement. Where I live, we call that an accident, or a terminal illness. We do not call that murder. I’m sorry but I’m really sick of hearing people complain about the police, & I’m sick of hearing people complain about the protestors. Most of the protestors are probably good people, but there were a lot of good Christians in Germany; who agreed with their leader; & as a result over 60 million human beings lost their lives during WWII. Think about the possibility, a time may come when the man/woman all the sheep line up behind repeats the tragedy of WWII. I guess it would be called a mob mentality, good people doing terrible, unspeakable acts to other human beings without, in most cases, even knowing the truth.